Registration has begun for the Spring Educational Conference to be held May 14 in Raleigh. Click here for more information and to register. NCPHA is hosting member-only MCO Lunch and Learn Webinars during the month of May. The webinars are free but you must be a member to register. To learn more and to register, go here. Local Health Department Medicaid Cost Settlement Trainings are taking place in May. The locations are May 7 - Sylva, May 8 - Winston-Salem, May 15 - Fayetteville, May 16 - New Bern, and May 21 - Raleigh. Each session is $15/person and includes lunch. To register, go here. The Wellness and Prevention Section is hosting a section member call on August 26 at 3:00 pm. Click here for the flyer with more information. Finally, the NCPHA Young Professionals are hosting a Healthy Babies Initiative Conference on May 15 in Raleigh. Cost for the conference is just $20 for members or $30 for non-members. The registration fee includes lunch. Go here for more information and to register. NCPHA is extremely proud of its Emerging Leaders Program. The second cohort is well under way and the nomination process for the third cohort will begin in a few months (early May 2019). To read about the program or to read the group projects from the first cohort, go here. We are partnering to support More Powerful NC, a public education campaign that launches this week to raise awareness about the opioid epidemic and empower North Carolinians to take action to address the crisis in their homes, neighborhoods, and communities. The More Powerful NC campaign is supported by a coalition of North Carolina businesses, healthcare organizations, and state agencies that helped create, fund, and provide resources for this campaign, which was initiated by Attorney General Josh Stein and DHHS Secretary Mandy Cohen. 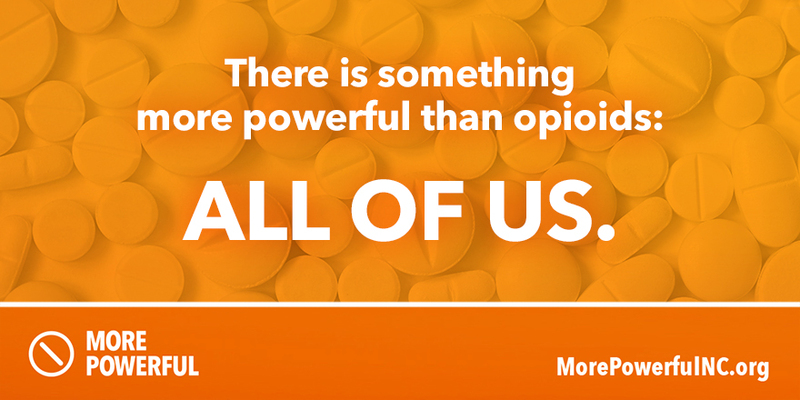 The campaign website, www.MorePowerfulNC.org, helps people understand the risks associated with opioids and provides treatment and recovery resources. The website also gives people a wide range of tools and ideas to get involved in their communities and be part of our work to confront the epidemic.We hope that you will take the time to visit the More Powerful NC website, take the pledge to take action. The NCPHA Advocacy Agenda was adopted by the Governing Council on February 20, 2019. Go here to see the complete agenda. Click here for the February 2019 NCPHA eNewsletter. This edition has lots of information and pictures from the 2018 Fall Educational Conference plus many NCPHA Section updates, member spotlights on Kelly Spangler and Will Broughton, and information on the upcoming NCPHA Spring Conference and the Young Professionals Healthy Babies Initiative Conference. Interested in doing some advocacy work but not sure how to address a public official? Check out our Protocol Cheat Sheet. It includes information on addressing (in person and in writing) local, state, national, and judicial public officials as well as former office holders. We hope you'll find it useful! Interested in the history of public health in North Carolina and NCPHA? We recently had many documents pertaining to the history of NCPHA scanned. The documents include conference agendas dating back to 1912 and newsletters to 1972. You can access the documents on this page. This will be an ongoing process since there are many to upload, check back frequently. The NCDPH Tobacco Prevention and Control Branch has released its updated Vision 2020 Plan! If you are young and new to the public health field, be sure to check out the Young Professionals Group for NCPHA members 21-39 y.o. To learn more about the group and how to sign up, go here. If you're looking for information on the health of our state's population, we've added links to the below page can direct you to important information regarding our state's youth, communicable diseases, cancer statistics, and more. The North Carolina Public Health Association is North Carolina’s leading membership organization made up of individuals dedicated to improving, promoting, and protecting the health and environment of all North Carolinians. A profound statement, and accurate as it may be, would not be possible without your support. With such a diverse and passionate membership that now numbers close to 1200 individuals, we are in an excellent position of strength as we embrace the changing public health landscape. interface between research and practice. The North Carolina Public Health Association is the leading professional association for people dedicated to promoting and protecting the health and environment of all North Carolinians. The Guiding Principles of the North Carolina Public Health Association are: integrity, dignity, respect, pride, commitment, inclusion and education for individuals and communities. I am fortunate to have worked in several disciplines of public health with many engaging, compassionate, professional, and good natured people that are driven by a similar purpose and intention. 2019 will be a 20 year milestone in my career and I look forward to the many new friendships, challenges and opportunities it will bring. I also look forward to celebrating 100 years of The Office of Public Health Nursing in NC at our 2019 Fall Educational Conference at the Grandover Resort in Greensboro. I hope to see you there! Finally, I invite you to get involved in NCPHA beyond being a member. Whether you are a seasoned public health professional or just beginning your career I challenge you to join a section, join a committee, or inquire about leadership opportunities. I look forward to working with you on the road to making the NCPHA one of the largest and most influential public health organization in the country.